Our current research aims to increase biodiesel production from microalgae via genetic engineering. Biodiesel has been considered as an alternative biofuel that can replace petrodiesel. The significant economic and environmental impact of using agricultural crops as a feedstock for biodiesel raises crucial sustainability issues. Microalgae have much higher rates of biomass and oil production than convention crops and can be grown in non-cultivable land. Therefore, microalgae are a promising alternative source of lipid for biodiesel production. However, currently, production of biodiesel from microalgae is technically, but not yet economically, feasible. Increasing lipid content via genetic engineering could improve microalgae as an economically viable biofuel feedstock. Neochloris oleoabundans, an unicellular fresh-water microalga, is able to accumulate 36-54% lipids of its cell dry weight under nitrogen starvation condition. Its triacylglycerol (TAG) comprises 80% of the total lipids and is mainly comprised of the saturated fatty acids containing carbon around 16-20 atoms, ideal for biodiesel production. 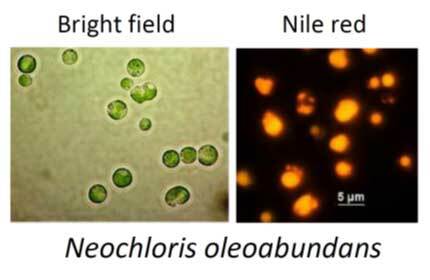 Because genetic manipulation of microalgae requires the accessibility to stable nuclear transformation, we have successfully developed a stable nuclear transformation system of the oleaginous microalga N. oleoabundans. 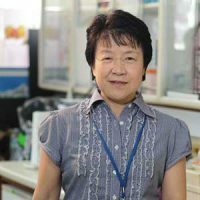 We aim to increase the TAG accumulation in N. oleoabundans by overexpression of genes involved in TAG biosynthesis. We are constructing and investigating the transgenic N. oleoabundans cells overexpressing the genes of Kennedy pathway. In addition, we are studying how the genes of Kennedy pathway are regulated. The knowledge of gene regulation in Kennedy pathway can be used to increase the TAG accumulation in microalgae. 1). Klaitong P, Fa‑aroonsawat S and Chungjatupornchai W*. Accelerated triacylglycerol production and altered fatty acid composition in oleaginous microalga Neochloris oleoabundans by overexpression of diacylglycerol acyltransferase 2. Microb Cell Fact. 2017; 16: 61. 2). Chungjatupornchai W*, Kitraksa P and Fa-aroonsawat S. Stable nuclear transformation of the oleaginous microalga Neochloris oleoabundans by electroporation. J Appl Phycol. 2016; 28: 191–199. 3). Chungjatupornchai W* and Watcharawipas A. Diacylglycerol acyltransferase type 2 cDNA from the oleaginous microalga Neochloris oleoabundans: cloning and functional characterization. J Appl Phycol. 2515; 27: 1499–1507. 4). Chungjatupornchai W* and Fa-aroonsawat S. (2014) The rrnA Promoter as a Tool for the Improved Expression of Heterologous Genes in Cyanobacteria. Microbiol Res. 2014; 169: 361–368.